Villa los Milagros, located in the growing rural town of Centralia in southwest Washington, provides new affordable apartments for working families. 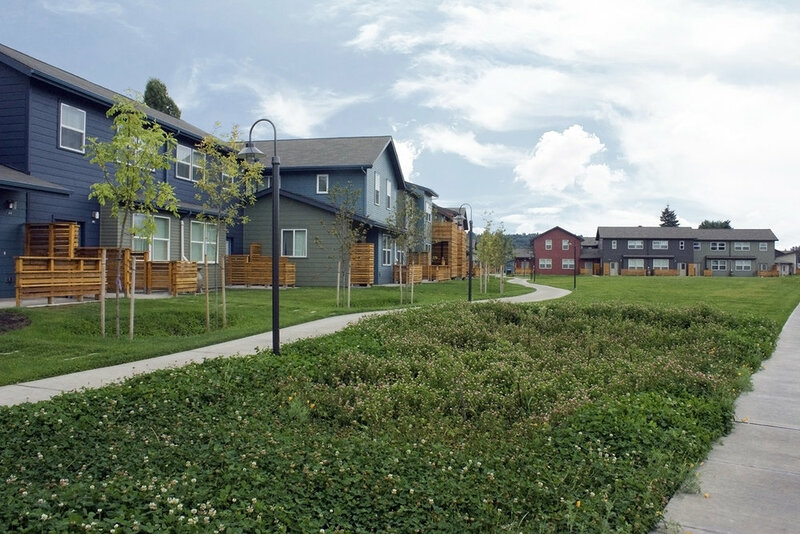 The twelve buildings include a mix of 2-, 3- and 4-bedroom townhouse units, which have ground floor entries, attached garages, private gardens with rainwater harvesting, compost storage containers and front porches that overlook the community green space. The family-oriented development celebrates the local agricultural context and seasonal cycles of life by providing opportunities for residents to harvest edibles from their private gardens, utilizing collected rainwater and community compost as fertilizer. Anchoring the community development is the commons plaza with meeting rooms, offi ces and play spaces. Meandering pathways, raingardens, and a variety of recreational and play spaces interconnect the residential and common spaces.